Those with friends or family who have served our country know that the worry, stress and pain do not always end once their loved one returns home. Many veterans return with both visible and invisible wounds, ranging from an acute medical issue to a long-lasting condition. Look at Air Force Master Sergeant Reese Hines, who spent more than two years in a hospital recuperating from an IED explosion that resulted in nearly 40 surgeries. It was not only physical wounds he suffered—traumatic brain injury and PTSD have required further treatments and may for the rest of his life. A big part of Reese’s recovery can be found in a surprising place. Not in the doctor’s office, but in the gym. According to the U.S. Department of Veterans Affairs, disabled veterans who participate in adaptive sports experience less stress, lower dependency on pain medicine, fewer secondary conditions and greater independence. I spotlight Reese because he will be the first to say that it was adaptive sports that took him beyond the traditional medical facilities, to participate in activities like cycling, softball, archery and field events. They even introduced him to his fiancée, Air Force Master Sergeant Kyle Burnett. Today, both Reese and Kyle are competing in the Invictus Games Toronto 2017, along with 550 other injured or ill athletes from 17 nations. Many experts agree that disabled veterans report better health, new friendships and an improved quality of life when participating in adaptive sports. Adaptive sports gave Reese and Kyle a sense of being normal again. They met playing sports in 2015, fell in love and became engaged playing sports in 2017. They will be married next year. It’s athletes like Reese and Kyle who inspire Fisher House Foundation to co-sponsor the Warrior Games and Invictus Games. Known for a network of comfort homes where families of wounded, injured or ill service members and veterans can stay at no cost while their loved one is receiving treatment, Fisher House is there to help during all stages of recovery. One of the most important parts of recovery is celebrating triumphs, so supporting adaptive sports events like Warrior Games and Invictus Games brings Fisher House Foundation full circle. 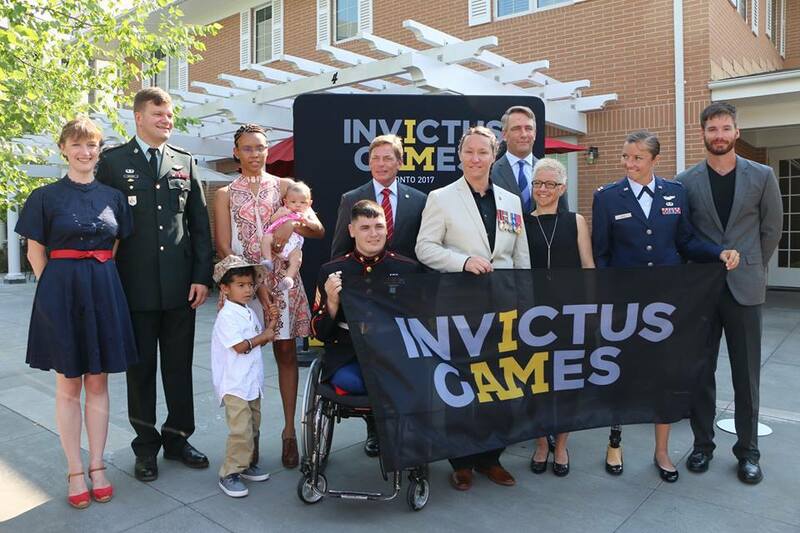 Both the Invictus Games and Warrior Games are more than just sporting events for competing athletes – they are a celebration for families who get to share in the fun and excitement. For some competitors, this is the first time their family is seeing them after their rehabilitation and for some, it means seeing that there is life after injury. Having a family’s love and support, and knowing there’s a whole community rooting for them, makes all the difference to these brave men and women. It is an honor and privilege to see these athletes and their families thrive – together. Ken Fisher has dedicated his career and life’s work to building and leading complex, multi-billion-dollar organizations and supporting military personnel and families. Ken Fisher is the Chairman and CEO of Fisher House Foundation, an organization best known for a network of comfort homes where military and veterans’ families can stay at no cost while a loved one is receiving medical treatment. The homes are located at major military and VA medical centers, close to the medical center it serves. Ken has overseen the construction of 71 Fisher Houses throughout the United States and has expanded operations to Germany and the United Kingdom. In addition, since 2001, Fisher House Foundation has helped more than 10,000 military children attend two and four-year colleges across the country by providing more than $15 million in scholarships. Ken served as Chairman of the Invictus Game’s Organizing Committee for the 2016 games in Orlando. The Invictus Games uses the power of sport to inspire recovery, support rehabilitation and generate a wider understanding and respect for wounded, injured and sick service men and women. Working with Prince Harry, the Games’ Founding patron, Ken led the effort to bring the Invictus Games to the United States. As challenges for America’s service members intensify, Ken has deepened his involvement with the military serving both the Democratic and Republic administrations. In 2007 he was appointed by the Bush Administration to the Presidents Commission on Care of America’s Returning Wounded Warriors tasked with conducting a comprehensive review of the care America provides to wounded service members returning from conflicts in Iraq and Afghanistan. For the past four years, Ken has served on policy roundtables in support of current U.S. Defense Secretary Ashton Carter and former U.S. Defense Secretary Chuck Hagel. Additionally, Ken serves on the Board of Directors for the United States Army Command and General Staff College, a graduate school for United States Army and sister service officers, interagency representatives, and international military officers. In 2012, Ken’s commitment and service was recognized with the Defense Distinguished Public Service Award, the Department of Defense’s highest civilian honor.